Okay, I think I am on to something here. 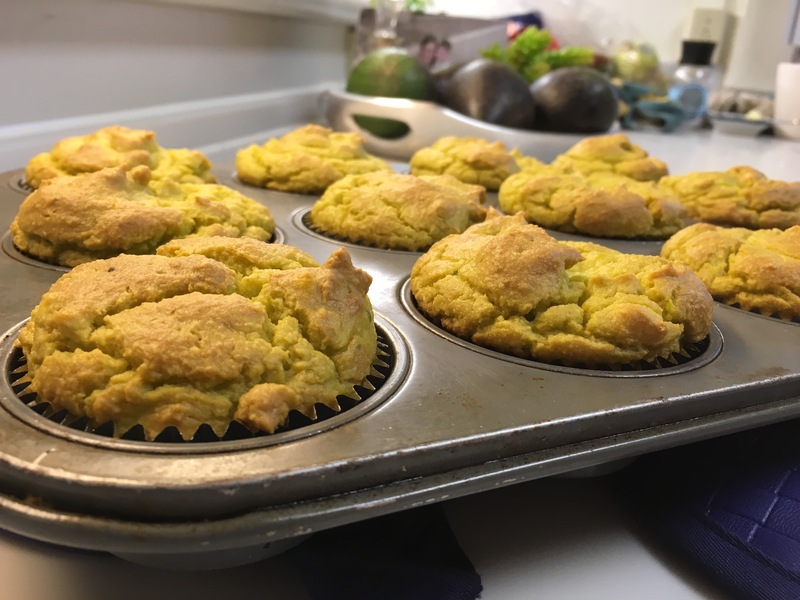 I have been in search of a savory staple muffin for a long time, but I just can’t do complicated recipes. If you are hesitant to go out on a limb and try these, let’s remember how healthful these ancient fruits really are. I am not typing a bunch of sentences to convince you. So, I will give you a few key words that may motivate you to grab some off the trees that you have in your yard, and get to baking: Superfood, Antioxidant, Potassium, Folate, Oleic Acid, Lutein, Satiety, Caloric Density, Not Eggs. With a hand mixer, mix up the avocados, oil and water until smooth and shiny. Then add in the rest of the ingredients and mix until you have a nice batter. Stir in your mix-ins. Bake at 350 for 23-25 minutes or until the tops are golden brown. I moved to Hawaii nearly 2 1/2 years ago, and there were many new foods I had never seen or heard about before living here. 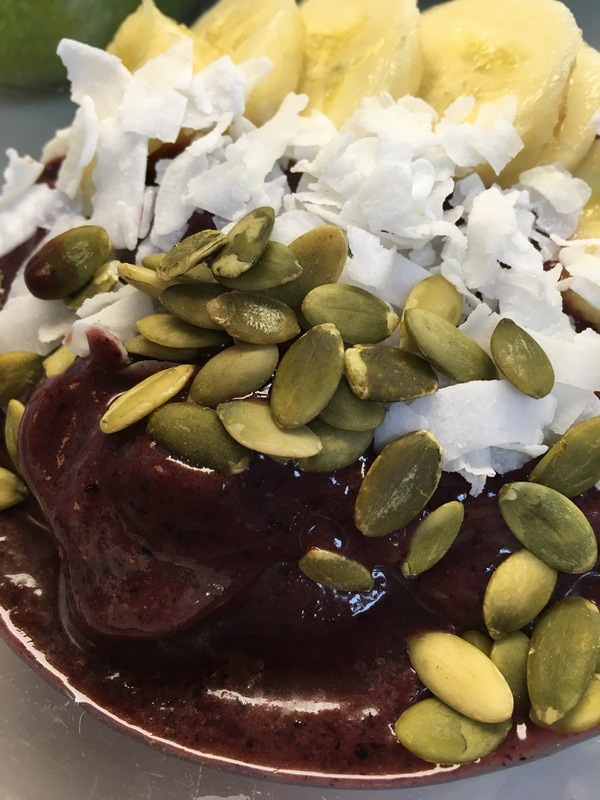 Shave ice**, Poke, Musubi, Loco Moco, and Acai Bowls…there have been so many new foods I have experienced! One that I’ve loved is the Acai Bowl. These are for sale everywhere here, usually around 8 dollars a pop (GAH!!). Because I am living life and not blogging much, I just assumed Acai Bowls are everywhere on the mainland by now and are not a novel concept anymore. However, when my uber-hip, jet-setting sister told me she had never heard of them, I decided to let you all in on this really fun treat, just in case you haven’t seen them or were not sure what is in one. This is just fun to eat. It’s breakfast, a cold snack, or comforting dessert. Throw them all in blender and mix. Consistency should be of a soft sorbet, you’ll have to scrape down the sides if you aren’t using a Vitamix with its tamper. Top with your favorite toppings: sliced fruit, coconut, nuts, seeds, chocolate chips, and a drizzle of honey if you want an extra kiss of golden sweetness. Next time you see these Acai Packets, grab them. THIS is what to make. **It’s not “shaved” ice. Shave Ice. Say “shaved” and you’re definitely a tourist! If you’re in my neck of the woods, let’s meet up at Surfer’s Coffee Bar for one of the best Acai Bowls on Oahu!! 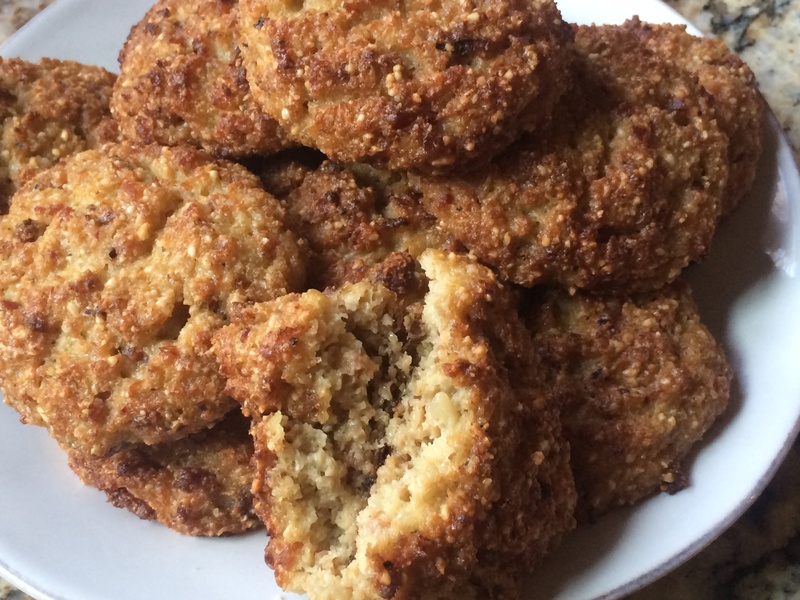 I whipped up these yummy biscuits last night to go with some leftover ham bone soup. The idea came from fastPaleo and the medium was one of my favorites: cauliflower. 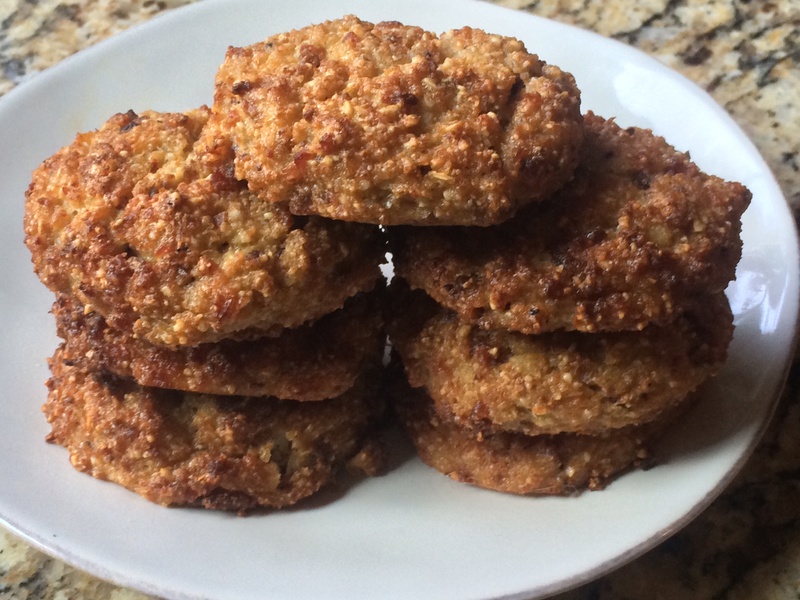 I loved that they were packed with meat and veggies, rather than a ton of almond flour. My kids loved that they were super tasty and spongy. Enjoy! Preheat oven to 375. Place bacon and chopped cauliflower on foil lined baking sheet. 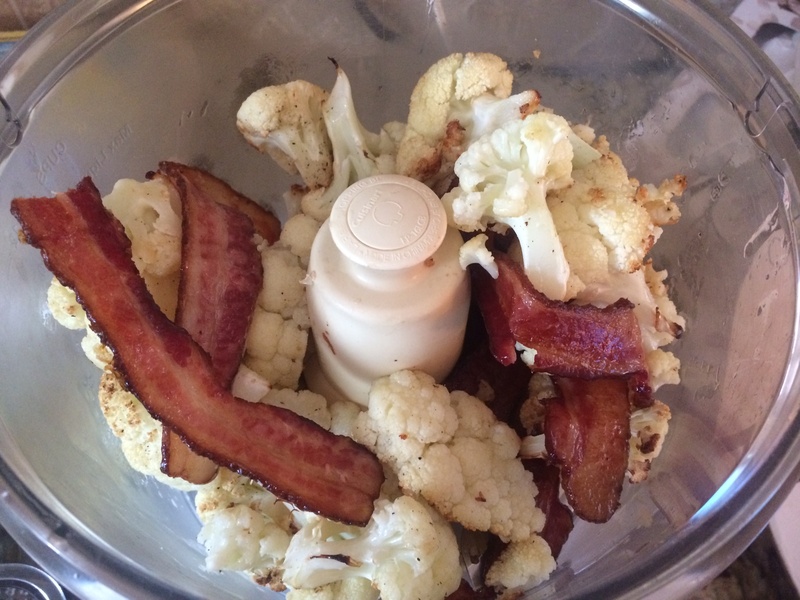 Bake in oven until bacon is cooked and cauliflower is nicely roasted–about 15-20 minutes. Halfway through, mix to coat cauliflower with bacon grease. Once done and slightly cooled, place contents of pan in food processor. Pulse until finely chopped. Keep yourself from eating too much straight out of the food processor! Spoon into mixing bowl. Add the remainder of the ingredients and stir to combine. Spoon onto parchment lined baking sheet into rounds. Bake for 15-18 minutes until nicely browned. Serve! Refrigerate leftovers. They would be perfect with eggs the next morning or alone as a quick snack.